The heterogeneity of coalbed methane (CBM) resources was not taken into account when the current indiscriminate subsidy policy was developed. In it, limited subsidy funds are given first to high-quality resources and even to subsidize profitable projects. Thus, the policy has had less than the intended effect in improving CBM production. To implement a new type of differential subsidy, it is necessary to grade the CBM resources, as will be discussed in this paper. After the factors affecting the resources value are systemically examined, sorted and merged, the relationship between the key factors and economic value is analyzed by an engineering economics method, and the production profile type, peak production (or stable production) and buried depth are used as grading factors. The production profile type is used to categorize, and peak production and buried depth are used to grade resources within the same category. The grading method is as follows: use subsidy levels at the economic critical point (NPV = 0) to identify the grades of resources, and determine the combination of peak production and buried depth for different resources grades base on indifference curves drawn according to the relationship between the economic value and peak production and buried depth. Natural gas consumption has been increasing from year to year in China, whereas the growth in domestic conventional natural gas production has been relatively slow, leading to an increasing degree of dependence on imported gas of up to 36% to date (BP 2016). In this context, unconventional gas resources, including coalbed methane (CBM), have gained attention from both the government and investors (Wang et al. 2016a, b; Wang and Lin 2014; Fuertez et al. 2017). The latest round of national petroleum resources assessment by the Ministry of Land and Resources estimates the amount of CBM resources within 2000 m at 30 trillion cubic meters, of which 12.5 trillion cubic meters are potentially recoverable (the Ministry of Land and Resources 2015). Despite the huge amount of CBM, profits from investing in it are low, and the development of CBM depends heavily on support from the government, especially production subsidies (Yuan et al. 2015). The successful experiences of foreign countries show that incentives have also played a critical role in their CBM industrial development (Luo et al. 2015). China has studied foreign experiences to enact policies for the CBM industry, such as tax exemption and production subsidy (Zheng et al. 2009). However, the effectiveness of the policies has been far below expectations. In 2015, the drilling production of CBM resources was 4.4 billion cubic meters, far from the projected goal of 16 billion cubic meters, and unsatisfactory policies are likely to be to blame except when the reasons are geological and technological. Currently, there is little room for tax exemption; thus, adjusting production subsidies is a high priority (Zhang et al. 2015). The current production subsidy standard is 0.3 CNY/m3 (The Ministry of Finance 2016), and the amount paid by the government depends on the production volume. Because the current subsidy policies ignore heterogeneity among CBM resources, the limited funds are given first to high-quality resources and even to subsidize profitable projects. Therefore, there are fewer opportunities to exploit lower-level resources. Hence, if a differential subsidy policy can be implemented based on grading the resources, more resources can be developed with an equal amount of subsidization. Moreover, as shown in Fig. 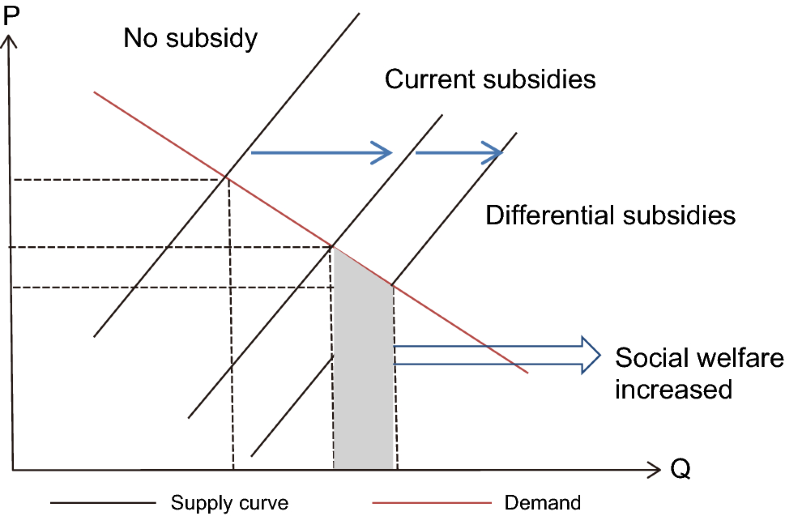 1 (in which the horizontal axis denoted by Q represents quantity and the vertical axis denoted by P represents price), the supply of CBM can increase under the current subsidy policy, and the increase in supply will continue to rise if the differential production subsidy is implemented, and thus, social welfare will increase as the CBM supply increases. An energy policy that considers differences among oil and gas resources is not original. As early as 1980, the Crude Oil Windfall Profit Tax Act in the USA classified crude oil into three categories and established three corresponding levels of profit tax rates (Logan 1980). Relevant studies show that the implementation of differential profits taxation has had a relatively large impact on US domestic oil production, especially on low-production wells and poor-quality resources (Knoll 1987; Verleger 1980). Similarly, scholars in China believe that the existing tax policy insufficiently encourages the development of inferior-quality oil and gas resources with lower profits, and suggest differential tax rates for different levels of resources according to the development stage, geological conditions and other relevant factors; they also propose some methods of classification (Luo 2005; Li et al. 2014; Ding and Dai, 2013). In the standard “Specifications for Coalbed Methane Resources/Reserves” (DZ/T 0216-2010) issued by the Ministry of Land and Resources of the People’s Republic of China, CBM resources are categorized separately by just one of the indicators of reserve scale, reserve abundance, production or buried depth (The Ministry of Land and Resources 2011). However, this grading method using a single factor fails to distinguish the general quality of the resources. For example, it is difficult to grade two deposits—A, with a deeper buried depth but high abundance of reserves, and B, with a shallower buried depth but low abundance of reserves—with this method of classification. To solve this problem, Li et al. (2016) proposed a comprehensive grading method that grades resources by both reserve scale and reserve economic value (measured by net present value (NPV)) under different discount rates. This method may be used to comprehensively classify resources; however, it requires an accurate calculation each time it is used, which is a serious obstacle; furthermore, policy makers usually lack the necessary professional knowledge to perform the calculation. Therefore, this method is not ideal for policy making. The benefits of deploying differential subsidies are obvious, but how to classify resources properly to coordinate them with differential subsidies is the first problem. 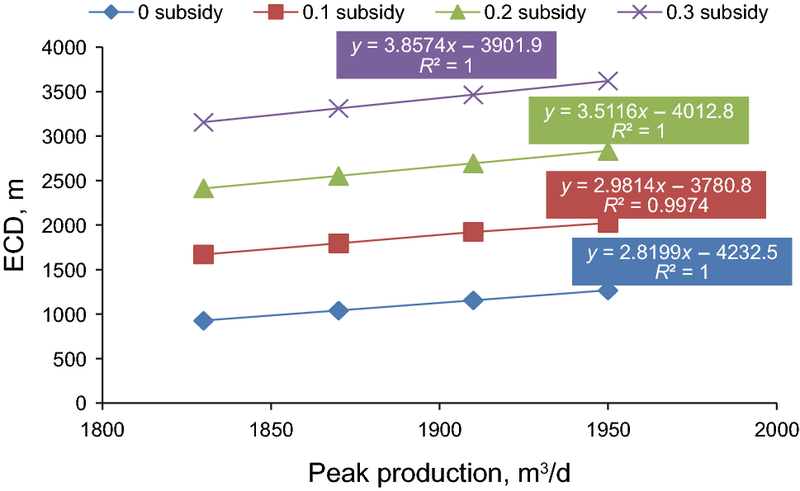 In this paper, geological, technical and economic factors are taken into account for use in grading CBM resources based on an engineering economic frame that analyzes how these factors influence the economic benefits of CBM resources under different levels of subsidies. The analytical results establish a feasible classification approach for the purpose of implementing a differential subsidy policy. Fundamentally, the quality of resources is determined by the economic benefits of exploiting them. The economic value of resources is affected not only by natural conditions, such as geological characteristics and terrain, but also by technological options and economic factors (such as gas prices and costs). Technological change, together with the costs related to development technologies, does not change the relative levels of resources so that they are ruled out. Gas prices and subsidies are similar in their relation to the economic value of resources, which can be proved through a sensitivity analysis; for this reason, price is not selected as an independent factor to grade the CBM resources. Based on the issues described above, the geological characteristics and terrain conditions are chosen to conduct a further analysis. Geological parameters, such as coal seam thickness, permeability, gas content, tectonic conditions, etc., affect the economic value of resources in two respects: benefits and costs (Li et al. 2000). These parameters affect the production characteristics of a single well and influence the benefits (Qin et al. 2008; Chen et al. 2009; Zhang et al. 2013; Qin et al. 2011; Zhang 2007), and a single well production profile can be used to represent the combined effects of those factors (Wang et al. 2007). In addition, the buried depth of the coal seam affects the drilling costs (Xia and Luo 2014). Furthermore, the terrain conditions influence mainly the surface facility costs (Zhu et al. 2016). In summary, a single well production profile, the buried depth of the coal seam and the terrain conditions are used to represent the quality of resources. A single CBM well production profile (determined by the predicted production, hereafter referred to as the production profile) indicates the drainage period and volume, the gas production start time, the peak occurrence time and the stable production period (Salmachi and Yarmohammadtooski 2015). Water drainage production during production is omitted because it affects mainly the water pumping and disposal costs, which are only a small proportion of the operating costs. Based on the gas production curve (decided by the production period, peak production and the stable production period), production profiles can be simply summed up as two types, stable production (type I) and single peak (type II), according to the summary of the characteristics of the CBM production curves by other scholars (Wang et al. 2016a, b; Liu and Zhang. 2016; Shao et al. 2013). Each of the profile types is subdivided according to the peak production (stable production), the rate of decline and the stable production period. Stable production is divided into two subtypes, type I-1 and type I-2, based on the stable production period and stable production, and single peak is subdivided into type II-1 and type II-2 based on peak production and the production decline rate (as shown in Fig. 2, where the production profiles are fitted based on the single well production data from a coalbed methane block). In addition, the difference in the production profiles among the wells is ignored; this is based on the fact that there is no significant difference among the wells within the same geological development unit in most cases, as is shown in the production of CBM in Hancheng and Baode. 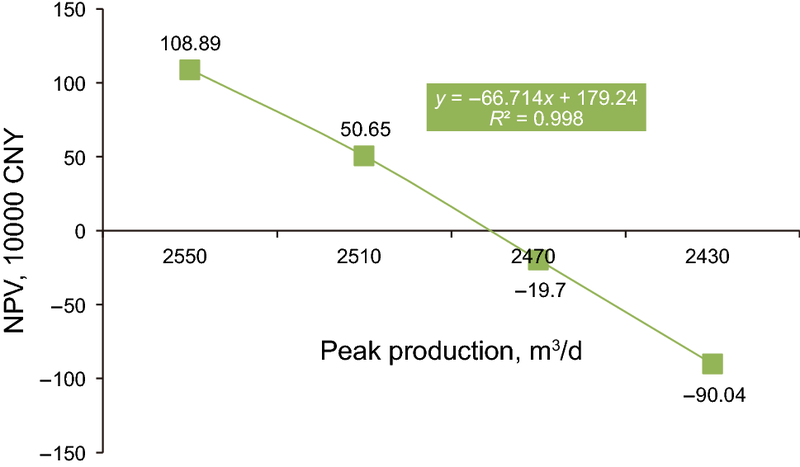 Moreover, when proposing a development plan, the adopted typical production curves are always at average levels, which will lower the impact of the differences among the wells. According to the Ministry of Construction (2010), the average well depth multiplied by the unit drilling cost is used to estimate drilling costs. Thus, an increase in the depth of the coal seam will lead to an increase in drilling costs (Langenberg et al. 2006). Considering the economic feasibility and the technological level of CBM exploration and development, the current maximum burial depth of available CBM resources can be determined as 1500 m, and the normal buried depth of the coal seam is generally 300–1500 m (Luo et al. 2015). Terrain conditions refer to a variety of forms of the land surface, which may be divided into five types in terms of construction difficulty (CNPC 2012): plains, tiny hillocks, large hills, low mountains and mountains. The economic value of CBM resources differs under different terrain conditions because the difference in the difficulty of constructing surface facilities results in different costs. For example, a well site on a mountain must be leveled, which obviously costs more than a well site on a plain. Since the economic value is the crucial criterion for assessing the quality of CBM resources, a method of economic evaluation is necessary. The engineering economic analysis based on discounted cash flow theory is the main method used to evaluate the value of oil and gas resources (Luo and Dai 2009; Ministry of Construction of People’s Republic of China 2010). In this section, the engineering economic analysis method will be used to construct a model that analyzes the influence of the factors on the resource value; then, the model will be used to grade the resources by the key factors. There are many indicators of profitability in engineering economics, such as net present value (NPV), internal rate of return (IRR), payback period (Tp) and return on investment (ROI). Among these indicators, NPV and IRR are the most popular and useful for assessing the economic value of oil and gas resources (Luo 2002). NPV is the sum of the present value of the net cash flow in each year according to a certain discount rate (as shown in Eq. (1)). IRR is the rate of return of the total recovery of an investment at the end of the life of a project; that is, the IRR is the discount rate when the NPV is zero (as shown in Eq. (2)). where Ci is the cash inflow, including financial subsidy income, sales revenue and liquidity recovery; Co is the cash outflow, including exploration investment, development investment, liquidity, operating costs, business taxes and surcharges, corporate income tax, etc. ; t is the number of the evaluation period (t takes a value between 0 and T); r0 is the discount rate; and T is the evaluation period. According to Luo and Xia (2015), with the premise of a stable gas supply, production profile types influence drilling plans and consequently influence the economic value of resources; thus, a qualification method for considering the production profile is proposed. The method is employed to analyze the production profile, and the buried depth and terrain conditions are also incorporated into the model (see Eq. (3)). 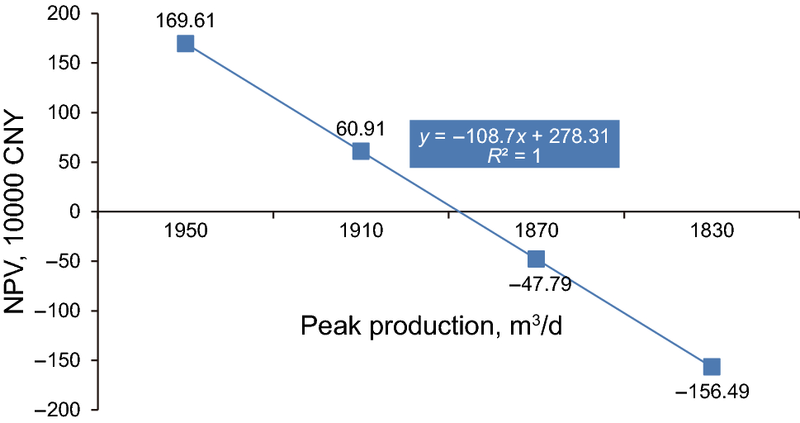 where IS is the surface facilities cost for the unit production in the standard condition, r is the adjustment coefficient of the geographical conditions (considering only the influence of the geographical conditions on the surface facilities cost), Qmax is the production capacity, T is the number of evaluation periods, PG is gas price, Q(t) is the production of period t, p is the commodity rate, FS is the production subsidy for unit production, Id is the drilling cost of the unit buried depth, D is the buried depth of the coal seam, IG is the completion cost for a single well, N(t) is the number of wells in year t, CL(t) is the operating cost in year t and Tx(t) is the amount of taxes in year t.
Formula (3) is an economic evaluation model, including the factors influencing the quality of CBM resources, which will be used to select the factors for grading resources by analyzing the relation between factors and economic value and then be used to develop grading plans based on the selected factors. The analysis process is shown in Fig. 3. In the process of analyzing and selecting the factors affecting the value of coalbed methane resources, only resource characteristics are considered and the types of wells (vertical wells, cluster wells and horizontal wells) are not discussed. There are two reasons: first, currently, the coalbed methane development is dominated by cluster wells and vertical wells; second, the change of the well types does not alter the relative grades of resources. The example given below will explain the second reason. Because the drilling costs are similar between cluster wells and vertical wells, only the comparison between vertical wells and horizontal wells are carried out. As shown in Tables 1 and 2 (the data are derived from coalbed methane fields. ), two types of resources C and D are, respectively, developed in both vertical and horizontal wells. The results of the financial analysis indicate that the NPV of unit investment of the resource D is much more than that of the C resource whatever the well types (as shown in Table 1 that the NPVs of unit investment of the resource C and D are, respectively, − 0.279 and 0.524 when resources are developed in vertical wells while the values of them will become − 0.426 and 0.841 if developed in horizontal wells shown in Table 2). That is, the well types only affect the absolute benefits of the CBM development, but do not affect the relative grades of resources. Hence, the following calculation is based on the development plans with cluster wells, and the basic data used are shown in Table 3. The production profile type, the peak production, and the stable production period affect the economic value of the resources. We first discuss the influence of the production profile type and then analyze the effect of other production characteristic parameters. To compare the production profile types without interference, we assume the same recovery rate for different types, set production data according to the profile types mentioned in Fig. 2 and then calculate the indicators using Eq. (3). The results are shown in Fig. 4. The results show that the production profile types have a significant effect on the economic value of resources that is reflected in two aspects. First, Class I is superior to Class II in general and is especially significant when comparing type I-2 and type II-2. Second, the internal character of each separate profile type is different, and the degree of difference between subtypes within type II is much larger than within type I. To further explore the effect of the production profile types on the resources classification used for differential subsidies, a sensitivity analysis of the indicators of the subsidy was conducted under each production profile type. The results shown in Table 4 and Fig. 5 indicate the difference of the sensitivity under the different production profile types, which is also evidence of the necessity of a differential subsidy policy based on grading resources. Undoubtedly, the profile type is a factor that influences the value of resources and should be selected for resource classification. However, it cannot directly determine the resource value alone. In addition to the profile types, production parameters (peak production (stable production), stable production period, production decline rate, etc.) should also be considered. As shown in Fig. 2, the main parameters of type I are stable production and stable time, and the main parameters of type II are peak production and production decline rate. After the calculation, the results show that the peak production (or stable production) of the two profile types influence the resources value significantly with the same recovery rate, while the effect of the other parameters is relatively weak. If all the factors were taken into account, the classification would be too complicated. Hence, based on the analysis, only the key parameters, peak production and stable production, are selected here. Four cases of average daily production of the peak for each production profile type (NO.0, NO.1, NO.2 and NO.3 represent the four cases of assumed peak production, and the difference between the two adjacent numbered peaks is 40 cubic meters per day) are shown in Figs. 6 and 7. 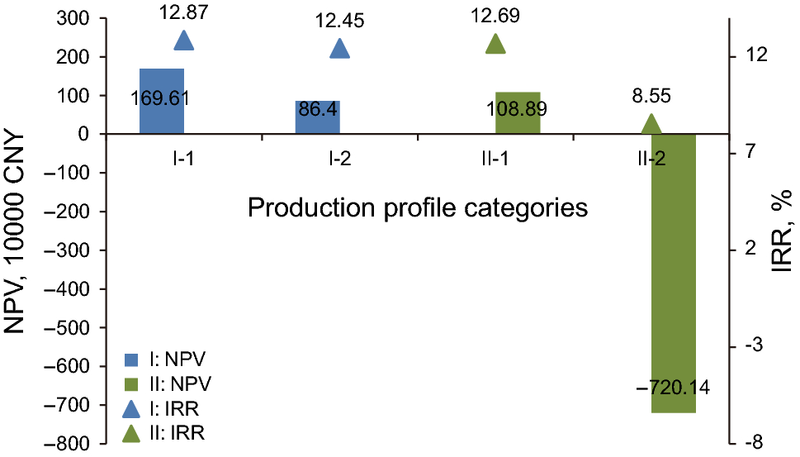 After the NPVs with different peaks are calculated, the relation between NPV and peak production under each production profile type is clear that the value of NPV decreases as peak production reduces (as shown in Figs. 8 and 9). What is more, the fitting curves in Figs. 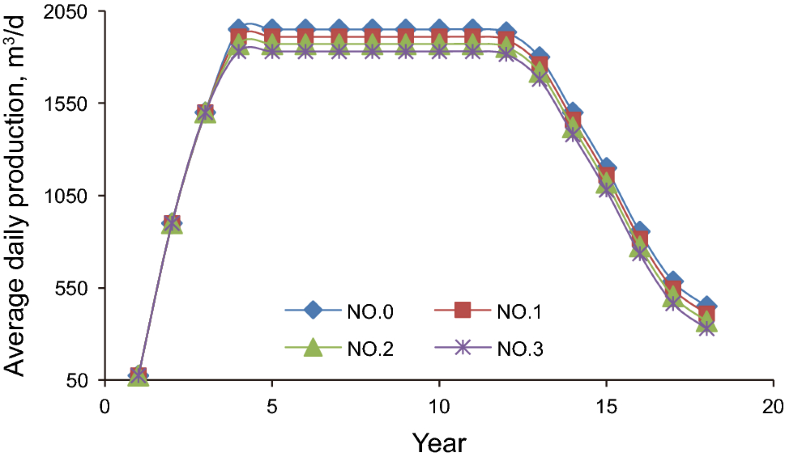 8 and 9 show that the NPV is linearly related to the peak production. 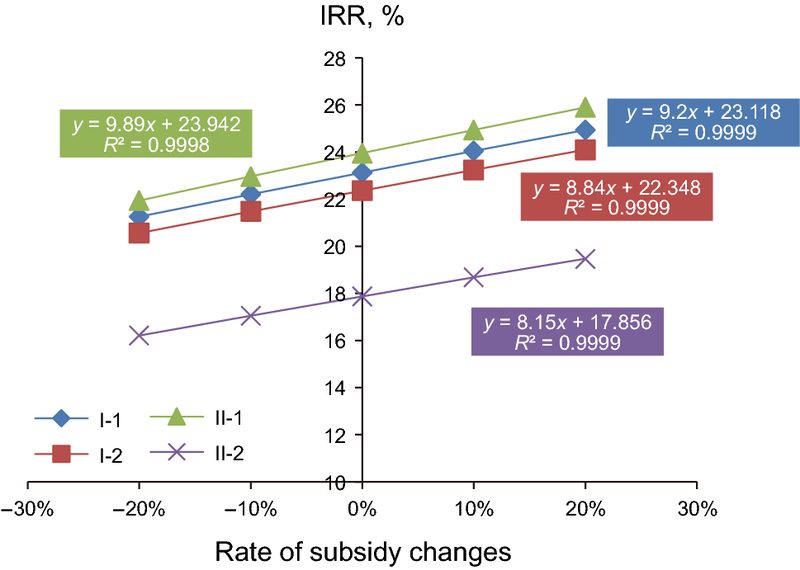 Is the linear relation vulnerable to the change of subsidies? 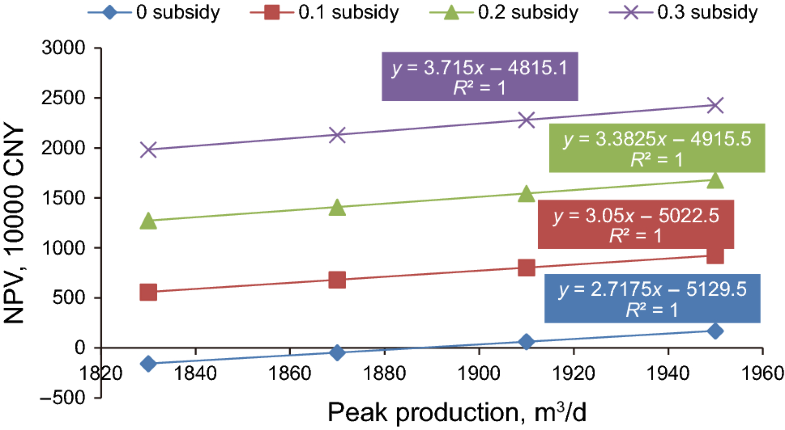 To answer this question, regression curves are made separately under four different levels of subsidies represented by 0 subsidy, 0.1 subsidy, 0.2 subsidy and 0.3 subsidy (which means that the production subsidies to CBM are, respectively, 0 CNY/m3, 0.1 CNY/m3, 0.2 CNY/m3 and 0.3 CNY/m3). The results show a stable linear correlation between NPV and peak production of both production profile type that does not change with the subsidies (as shown in Fig. 10). 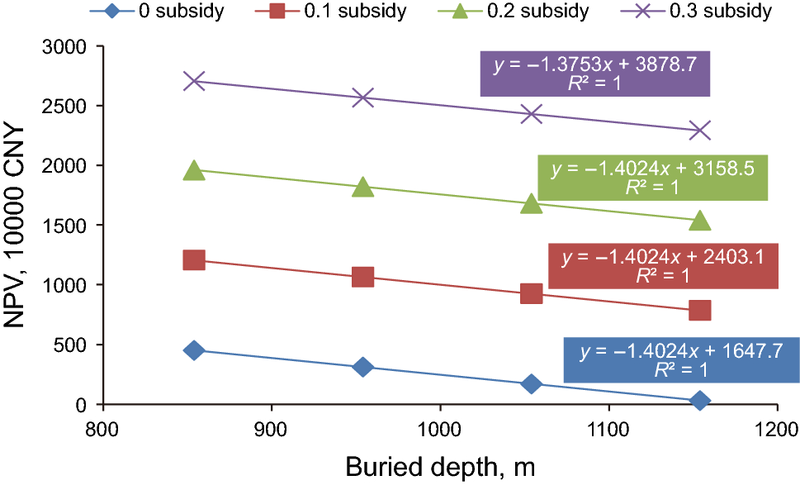 Based on a calculation similar to that conducted for the production profile, the relationship between the buried depth and NPV under different levels of subsidies, which is also linear under both type I and type II, is shown in Fig. 11 (Type I is shown in the figure, and type II is the same as it.). As mentioned previously, terrain conditions may affect the economic value of resources owing to their influence on the cost of constructing surface facilities. However, analysis shows that this factor plays a less important role. The results of the sensitivity analysis on the three factors are listed in Table 5, in which the figures show an increase of 0.16% in the IRR when surface facilities costs decrease by 1% and also show that the IRR is far less sensitive to terrain conditions than to the other factors. Furthermore, according to a standard released by the CNPC (2012), in which a list of coefficient values is provided to adjust construction costs under different terrain conditions, the range of the change rate is within 30% (Table 6). Using the change rate and the sensitivity of IRR, the change in IRR turns out to be less than 0.048%, which is low enough to be ignored. Hence, the terrain conditions are not selected to grade resources. Based on the analysis of the effect of the production profile type, peak production (stable production), the buried depth of the coal seam and terrain conditions on the value of CBM resources discussed in Sect. 4.1, two conclusions are reached: the production profile type cannot directly determine the quality of the resources, but the sensitivity of resources with different production profiles to the subsidies differs. Thus, it is necessary to classify the CBM resources first by production profile type; peak production (or stable production) and the buried depth of the coal seam significantly affects the economic value of the resources, which should be used to grade the CBM resources. The purpose of subsidizing CBM is to make the resources that cannot be developed economically (i.e., NPV < 0 or IRR is less than the benchmark discount rate) reach the economic breakeven point (i.e., NPV = 0 or IRR equals the benchmark discount rate) with subsidies. To achieve this purpose, high-quality resources need smaller subsidies and even should not be subsidized, while poor resources need much more. The economic value of the resources (indicated with NPV or IRR) can be described with a function of subsidy, production and buried depth (as shown in Eq. (3)). Given the levels of subsidies, the value of production or the buried depth at the breakeven point can be calculated through NPV = 0 (or IRR = the benchmark IRR), which is defined as the economic critical production (ECP) and economic critical depth (ECD). Conversely, production (ECP) or the buried depth (ECD) can be used to distinguish and label the classification. It is important to note, however, that with one equation (NPV = 0, and given the levels of subsidies), the two independent variables (production and the buried depth) do not have a unique solution. Taking the type I production profile as an example, given a set of production data, the corresponding ECDs under differential subsidies can be calculated (as shown in Table 7); Similarly, the ECPs can be calculated with given depths. 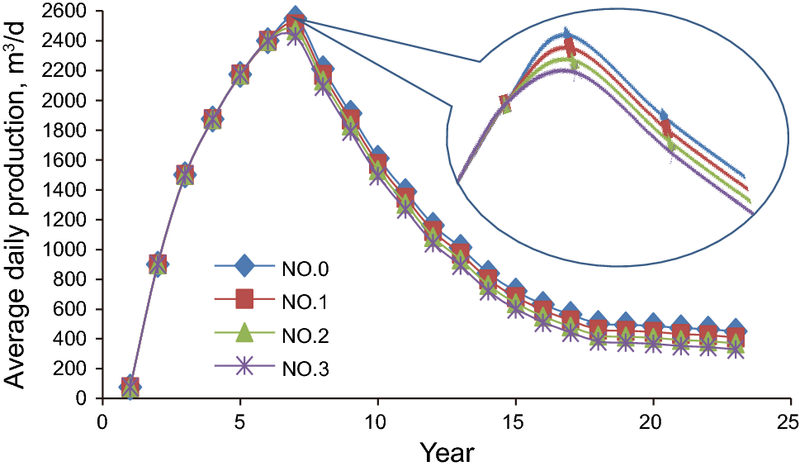 Scatter plots and fitting curves can be drawn with the data in Fig. 12. The curves are the indifference curves of resource quality (each indifference curve represents a grade of resources with the same economic value), and the points on the curve represent different resources, indicated with the values of production (or ECD) and depth (or ECP). Points on the same curve means they have the same economic value and need the same amount of subsidies, and each curve represent a series of resources with the same economic value (or the same amount of subsidies needed). Given the production (or depth), the ECD (or ECP) is calculated under particular levels of subsidies. The following is an example of grading resources of type I using the two factors. In “Specifications for Coalbed Methane Resources/Reserves,” the resources are divided into three categories by the values of 1000 m and 500 m (Table 8); taking the values of depth and the given levels of subsidies (from 0 to 0.3 CNY/m3), ECPs are calculated (Table 9) and used to provide a grading plan (Table 10). In the same way, another grading plan for type II is created (Table 11). Considering the limitations of the existing policy, we propose that differential subsidies be implemented for different grades of CBM resources. However, the existing grading method of CBM resources does not meet the needs of differential subsidies. Therefore, we establish the method of grading resources using key factors, such as the production profile type, peak production (stable production) and the buried depth of the coal seam, and labeling the resources with the required minimum of subsidies. Although the production data used in the paper are from special CBM areas, the general guidelines suggested in this paper do not alter with the data. When practicing the suggested method, the government can set a benchmark for the parameter values and the corresponding grading plans and subsidy levels. For example, suppose that the benchmark gas price is set at 1.5 CNY/m3, and the corresponding subsidy amount is 0.3 CNY/m3, the subsidy amount will be decreased to 0.2 CNY/m3 when the gas price increases by 0.1 CNY/m3. It is obvious that a differential subsidy policy can perform better than the existing one, even if the method of grading resources deployed for the policy is not perfect. This study focuses on grading CBM resources from the perspective of subsidizing CBM and therefore does not discuss the optimization of subsidies, which should aim to improve social welfare by a cost–benefit analysis. In addition, the potential game between the government and the investors caused by information asymmetry, which probably occurs in the process of implementing the differential subsidies, is not explored. Additionally, the uncertainty of the grading factors (especially the predicted production profile), which may have unforeseen consequences, is not considered. All of these issues must be further studied. 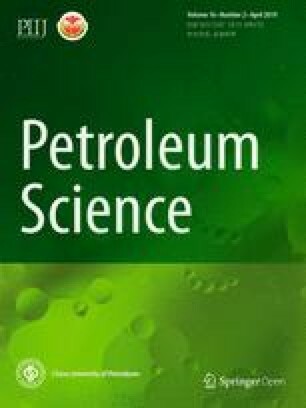 In addition, the research target and the methods proposed in this paper can be applied to other oil and gas resources (such as shale gas). Financial support from the Ministry of Science and Technology of China (No. 2016ZX05042-002-004), Science Foundation of China University of Petroleum, Beijing (No. 2462015YQ0718) is gratefully acknowledged. BP. BP statistical review of world energy 2016. 2016. http://www.bp.com/statisticalreview.